The rarely-exhibited works of Chicago-based artists Robert Johnson and E. Nix are at once extraordinary, challenging and filled with moments of great beauty. Despite each artist working in disparate mediums--Johnson is best known for his reverse glass paintings on discarded windows and Nix’s background is in blacksmithing--their art is similarly informed by personal struggles and their daily efforts to overcome trauma and addiction. Johnson and Nix both have devoted followings among primarily African-American collectors in Chicago, but are largely unknown outside these circles, keeping with Intuit’s dedication to highlighting undervalued artists overlooked by the mainstream art world. Johnson has created reverse oil paintings on found windows since the mid 1990s. For the artist, this method keeps the colors “alive and free” while the glass itself creates a dimension which simultaneously separates viewers from the painting and reflects them within it. His works are marked by a vivid expressiveness and masterful handling of color. Widely collected on Chicago’s south side in the ‘90s and 2000s, Johnson abandoned painting in 2007 to join the army as an extreme form of drug rehab and fiscal support for his family. After serving in Iraq he settled in Colorado for several years. In 2018, he relocated to Chicago and returned to painting, harnessing his highly-developed technical skills and fresh use of unconventional materials to enter into a new phase of artistic creation. A protégé of the late Erwin Gruen--master blacksmith and founder of Gruen Gallery in River North--Nix is a metal worker and multimedia artist. Initially instructed by Gruen in the process of creating iron furniture, tables, African art stands and pedestals, he has since developed his own distinct aesthetic. Nix is comfortable working in a wide variety of materials, as seen in his steel and polyresin sculptures or his two-dimensional collaged images and acrylics paintings on wood. 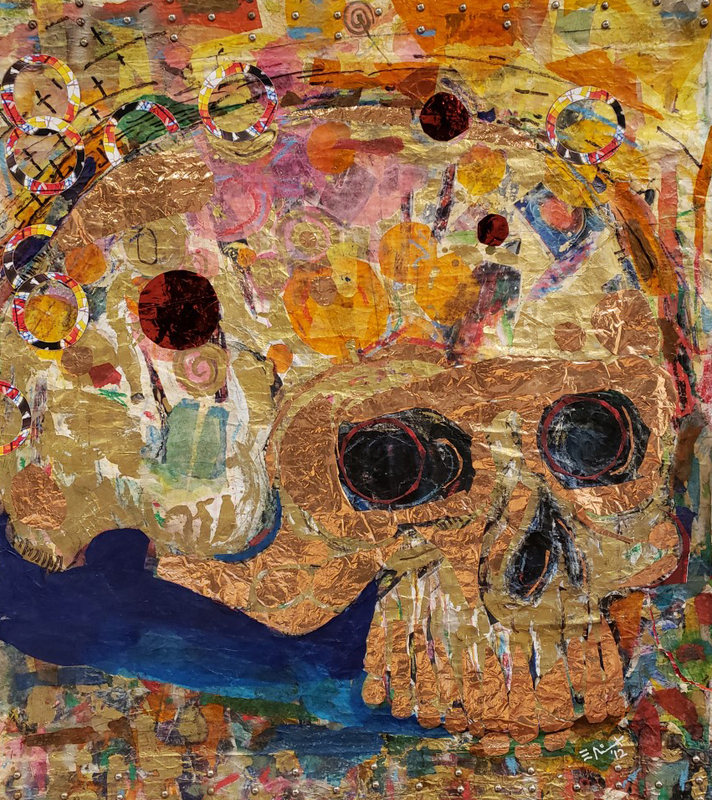 These visceral works often deal with addiction and dangerous experiences that, in the words of the artist, can either bring about self-destruction or metamorphosis. Though no artist’s works are bound by their biographies, the challenges both Johnson and Nix face inform their art. They act as catalysts for their creation and appear as their themes. As a result, the art is beautiful, sad, even scary. Despite their power, these works remain largely unseen by the public, providing Intuit an opportunity to again promote talented yet neglected artists, particularly at a time when terms like “folk art” and “outsider art” are being reexamined.